Operating a vehicle rental agency in the digital age is a challenge. Use the CRX Booking Engine – the platform that best matches your drive to grow. The CRX Booking Engine enables renters to book real-time, online reservations at your company’s website. It generates rich streamlined, flexible Rental Center web pages, designed to convert online visitors into renters. The CRX Booking Engine is the core of your rental center pages and is seamlessly integrated into your rental agency’s website. The CRX Rental Center is flexible and scalable and adapts to your web layout, graphics and business requirements. The CRX Booking Engine & Rental Center is a web-based application service, hosted on our high performance network. We provide a reliable online infrastructure, enabling secure renter access to reservations on your website. As an added bonus, CRX Rental Center users also get instant access to a global customer base through the CRX Travel Network like Carrentalexpress.com and Kayak. 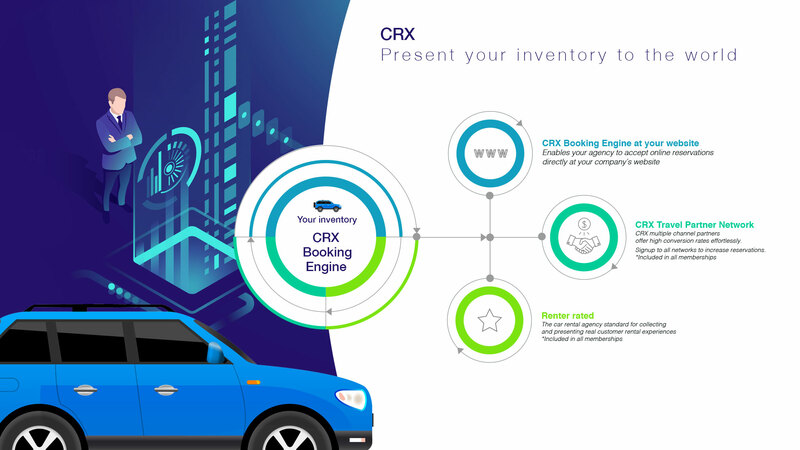 learn more How does the CRX Car Rental Booking software Work?